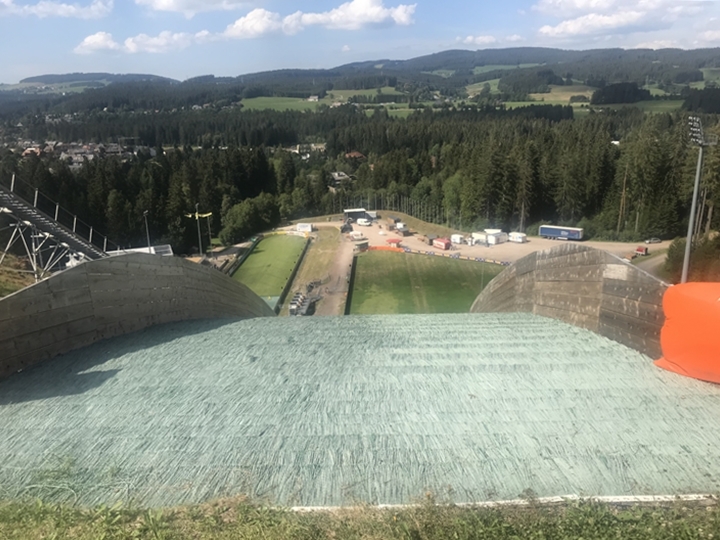 Insights into the thoughts of ski jumpers and coaches and even more "behind the scenes" - that was waiting for our columnist Luis Holuch in Hinterzarten either. 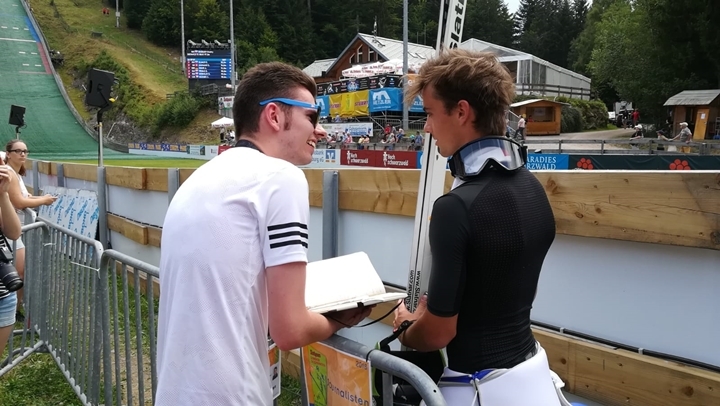 He spoke to the Slovene Ernest Prišlič who made a fabulous comeback recently and he also spent two training sessions among very successful ski jumping coaches. 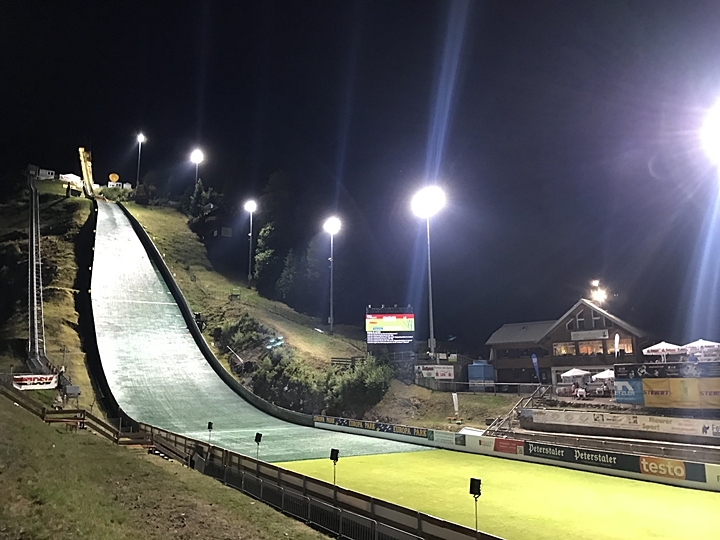 We hope you will enjoy the second part of "Luis on Ski Jumping Hill Tournament at the summer-grand-prix in Hinterzarten"! 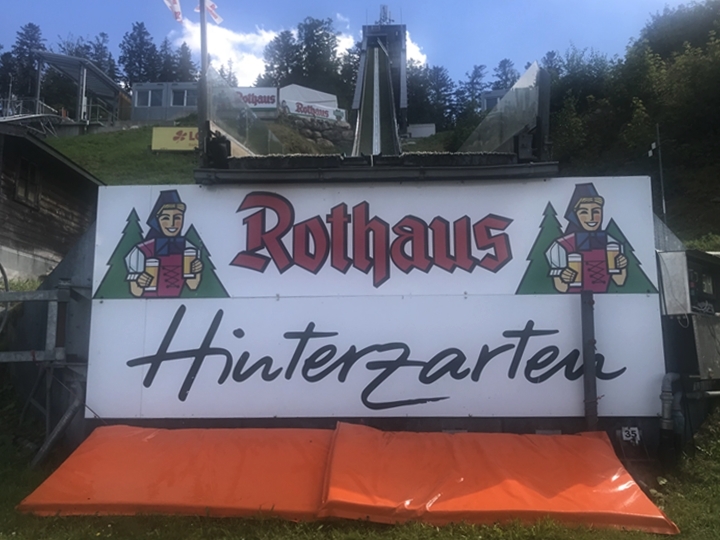 I enjoy the stays in Hinterzarten mainly because almost everything is so familiar: The village is staying just as it is, the weather is usually good or fantastic and you know the people around you. Especially the media team is taking great care of us journalists. That starts with being available for everyone and being transparent, goes over providing interviews and finishes with bringing food and beverages. Especially when it is hot, just as these days, and you have to watch out you are not dehydrating or getting sunburned, you are really thankful for the offered food and drinks. Then, a cooled bottle of water is on top of the drinks charts. But also the various types of cake are really enjoyable. "Do you actually make them by yourselves? These are absolutely delicious", I asked Anna, one of the volunteers. "Hehe no, we are getting them from the local baker. But I will tell him you liked them a lot", she smiled. "Yes please, he really deserves that compliment", I answered. It may sound a bit different, but I do not have a lot of appetite when it is that hot. Sometimes I even have to force myself to eat something, even though I am standing at the hill for seven or eight hours, like I did that weekend. But in the breaks or after a successful meeting you reward yourself with a piece of cake. So did I on late Friday afternoon. 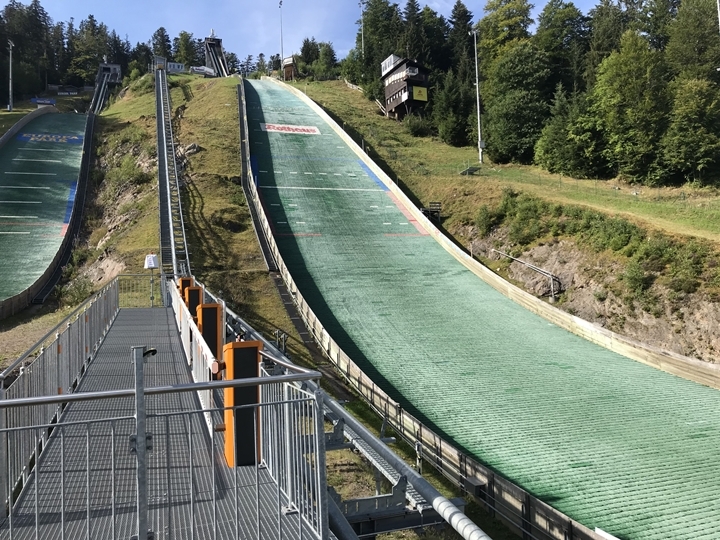 The second training jump of the men is in progress and I am waiting for my interview partner. His story moved the whole ski jumping family, but mostly outside of Germany. Which was the reason for my excitement. With his 24 years of age, Ernest Prišlič really is not a veteran. The Slovene always was considered as a talanted jumper, who also could break through until world-class level. 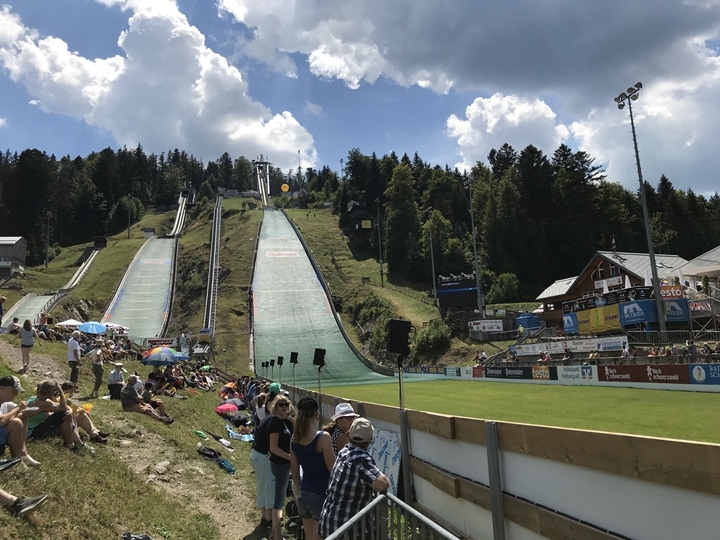 His biggest showcase took place in Planica 2016, where he firstly flew 246 meters during the flying hill test and continiously performed very well as a trial jumper – most of the times a lot better than some of his countrymen in competition. A lot of people were asking themselves why this guy was just a trial jumper that weekend. And no answer was given on that question until now. However, as good as this year 2016 started off for him, as bad was the ending. 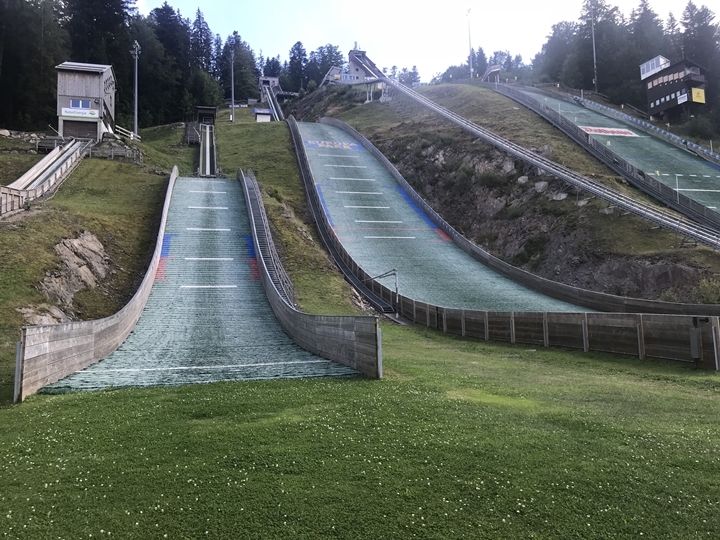 Only a few days before Christmas, Prišlič went on a short run with his team mate Anže Semenič to warm up for a jumping session in Planica, as both of them got hit by a worker's car. Semenič had luck in this accident and only suffered from minor injuries. Prišlič suffered from difficult head injuries and fell into coma. It took two weeks until he woke up again and his future was not really clear. "But, I always hoped that I could come back again", he told me. "It was tough to stay patient all these days, but it was good training for my mental health and that is very important in our sport", he added. For sure, his wedding with his long-year girlfriend Sabina in July helped him a lot either. In February, he passed the medical test which allowed him to start jumping again, what he did in May then. "And then, everything went really well. I do not know why, but it did", Prišlič said. Everything feels a bit like when he was younger and approaching bigger hills one after another, he explained. "I just went step by step. I cannot tell you how many jumps I did on smaller hills, before I went to normal and large hills, I did not count", he smiled. 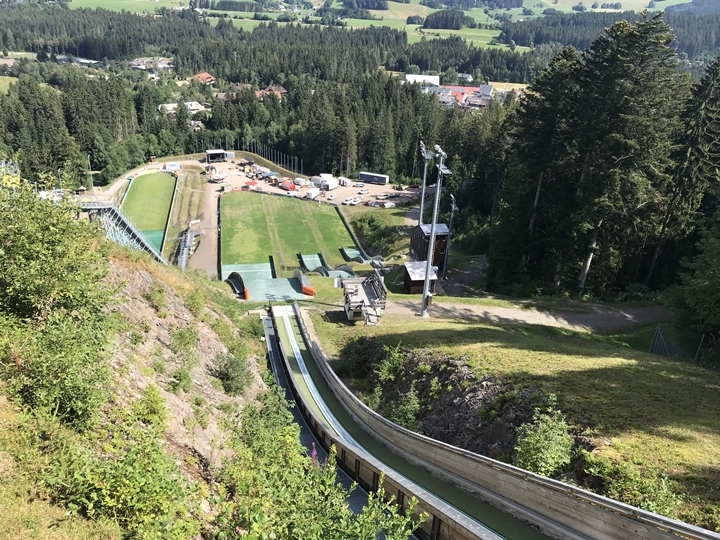 Much more clear for him was the answer on the question the new Slovenian head coach Gorazd Bertoncelj if he wanted to compete here in Hinterzarten: "I immediately said yes." In my last question to him I wanted to know which goals for the summer and winter he has. His answer: "Goals? (laughed) I hope I will never ever have goals in ski jumping. I just want to enjoy and worship this. I did not imagine I would get this time. And now I am just thankful and grateful that I can experience that. If I can manage to enjoy it, everything will work out good for me." I was positively shocked and had to take a short breath. He nodded and smiled patiently, so that I at least was able to thank him for the time and wishing him all the best. Wow, what an awesome guy, I thought. Currently, being in a time where most of the people are just trying to optimize themselves, where big words count more than big actions, were higher Instagram and Facebook follower do count more for many people than real human beings, I am speaking to a guy who does not care about this at all. This man is just thankful for being able to follow his passion and about the fact that a tragic accident did not take too much from him as everyone was expecting. There are not enough hats on this world as I would take off to him. I noticed some changes in my behavior in the last couple of months and am strictly against click- and like-baiting, but his attitude towards life is extraordinary (nowadays). This man is an inspiration to me, I honestly have to say. There were not too many interesting details about the competitions on Saturday, I guess most of you were watching it anyway. No surprise: A strong Polish team in a summer-grand-prix and a constantly dominating Kamil Stoch. Another story from the bright side: The good performance of the mixed up German team and of course, the first podium for Swiss man Kilian Peier. But in contrast to 2013, the whole schedule of action was a bit lighter. While back then, it was no surprise to see a couple of jumpers in the spectators’ village at the bottom of the stadium, this time most of the teams left right after the competition. Most of the ladies’ teams did not even stay for the men’s competition. The big exception were the teams from Italy. 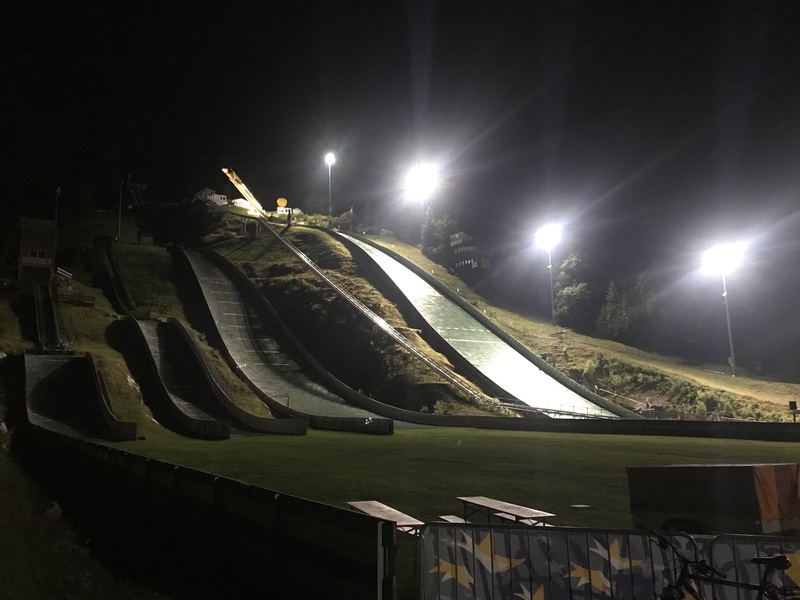 Manuela Malsiner told me on Saturday after the competition they would stay two more days and train on Sunday on the hill. So, it was clear for me what to do on the "free" day. I was back in the stadium again at 9:30 in the morning and waited for the first jumps. It was quite hot already and had to watch out I would drink my bottle of water too fast. It took half an hour until the Malsiner sisters jumped for the first time. We took the elevator back to the inrun together and were watching downhill. "Those poor guys who have to remove all the tents, wagons and huts. Thank god we do not have to do it", I said. "Yeah! But actually, it is still too hot for jumping", Lara answered. "Are you girls here just with Janko (Zwiter, head coach of Italy’s ladies’ team and private coach of Sara Takanashi, note by the editor)? ", I wanted to know. "Yes, it is just the three of us. The boys are here with four people. But Janko surely will be happy if you go to him. We told him you would be here", Manuela said. "That is good, I wanted to go to the coaches’ tower anyway", I smiled. We went out of the elevator and separated. The coaches’ tower has been renewed lately, so also the access and security were improved. From afar, I already saw Janko, as well as the men’s coach Łukasz Kruzeck. As I made the first steps on the platform, I also noticed Michael Lunardi, who belongs to the coaches’ staff since the beginning of this season. He was supposed to film all the jumps and I gave him my hand. Then, I went between Janko and Łukasz. "I was waiting for you", Janko said. "Really? Nice to meet you too", I laughed. "Compliments on your book, I really like it", he nodded. "Thanks a lot, a compliment from such an insider is a big deal for me. I guess that already was the highlight of the day", I answered. As long as we were waiting for the jumpers, we discussed the competition the day before and also the future plans for the ongoing summer season. The jumpers said their name through a walkie-talkie and then received feedback from the coaches. A very interesting fact: Łukasz speaks English with all his athletes, except Alex Insam, who speaks German. He told every jumper what he would like to correct in the next jump. And he wrote down every distance as well as the feedback on a piece of paper, so that he would have a protocol of the whole session. When he was talking with Janko and me, he spoke German. And I was surprised how much into detail he could go also in this language. "Imagine, you would work with Polish jumpers. Would you give as much feedback as now or even more? ", I asked him. "I always give the same amount of feedback, but just useful stuff. Timing at the take-off is not a topic, the boys notice if the jump was good, too late or too early. But the position of the skis is a very important topic. But, you should give too many information. It is impossible to correct every mistake within just one jump", he answered. The fact that he is working with a small group, has both advantages and disadvantages. Of course he has more time for every single jumper than in his days as Polish head coach, but the group lacks of dynamics. Nevertheless, everyone tries their best in course of the small possibilities. The most difficult thing, he said, is to keep the basics of the sport and discover new talents. This would be way harder than accepting the amount of money is small and he would have to think about it at least twice before he spends it on competitions and trips. Although the group he is taking care of, Janko Zwitter’s situation is a bit different. "How do you give your feedback to Sara (Takanashi)? Do you need a translator? ", I wanted to know from him. "Not anymore. One of her biggest wishes is that her English is going to be better and she works as hard on that as on her jump. She understands almost everything I am telling her. But speaking is not so easy. But we are working better together than ever before", he answered. "That is good news, for her and also for the sports. Someone, who wins so many competitions, is a representative of the whole discipline and if this person does not speak English so well, it is getting difficult", I said. Janko nodded and said: "You are absolutely right. But it will work out, for sure", before he picks up the walkie-talkie again. In the next round of jumping, the coaches continue their game "guess the distance". Their accuracy is amazing, especially when you know that you only see the first 50 meters of the jump from the tower. After the fifth of six jumps, Janko walks up to Michael and watches the videos on the iPad. I follow him discreetly and also have a look. The take-off and the first phase of the flight is not difficult to analyze for me, even without video. There, the details are better to see. Janko plays the video on repeat and stops them once he notices a mistake. He shows with his finger which detail of the body position he would like to see improved. It might appear that my knowledge is high and good enough that I do not have any problems to understand him, but I also did not notice massive use of technical terms. "Will you have another session today? ", I asked him in a watering break. "Yes, from two to four p.m., that was the only option the ski club gave us. But you can join us again, would be my pleasure", he said. "Yes sure. I actually learn a lot right now and it is just fun. Thanks for the offer", I answer. We said goodbye and I walked back to the apartment. 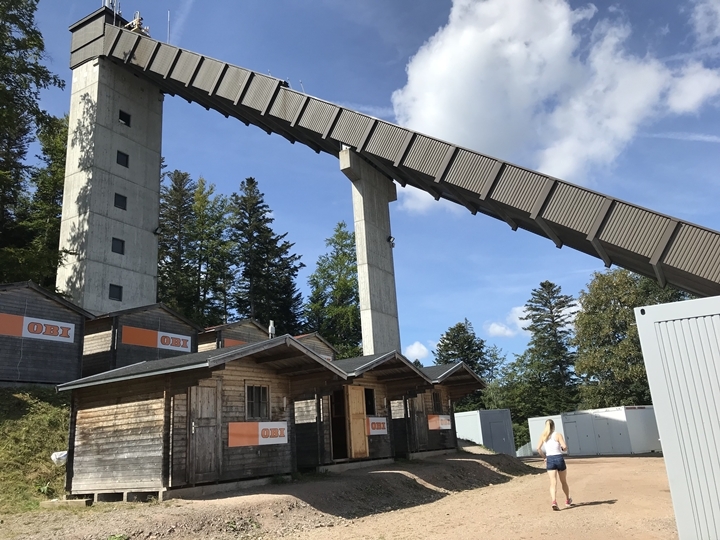 My friend and me use the short mid-day break for visits of the ski jumping hills in Breitnau and Neustadt. On the way back to the Adler-Skistadion we suddenly were hungry for ice cream, so we made a stop at the ice café Hinterzarten. Of course, the (small) outside area, was crowded. But luckily, there were free spaces inside and the air conditioner there was working perfectly. Just, as I ordered for the two of us, I saw another friend of mine, who is working as a photographer, standing at the bar. "Jan! ", I was yelling and waved. He waved back and went to our table. "Come, have a seat, I am going to invite you too", I said. "Oh thanks, I did not expect to see you again here. I thought you would have a slow day today", he laughed. "I actually intended to do so, but I already went to the hill this morning and now again to watch the Italians. If you want, you can join us", I laughed. "They are still here? I actually have enough of walking, I just came back from the Ravenna gully. But, your spoiler actually motivates me to come with you." We laughed, ate our ice cream and went to the stadium one last time. On the way there we talked about our travel plans for the rest of the season. Time was really flying, but as we arrived, we noticed that literally nothing was happening in the stadium, apart from the movements by the workers. "I know that from this morning, it took half an hour until finally someone was jumping", I sighed. The sun burned even harder than in the morning and my bottle was half empty already. It felt like a Deja-vu when the Malsiner sisters finally jumped. In the meantime, a group of tourists came to us, which also wanted to use the elevator to get up. But, although Jan and I knew how to use it, it does not wanted to make any move. Also Manuela and Lara did not make it start, so that Manuela yelled uphill to Janko to tell him that it was not working. In contrast to the morning session, me and all the others who were no jumpers were not allowed to use it anyway and so Jan and I walked up by feet. The breaks between the jumps were a bit larger than in the first session and so the talks were once again very intense and deep into the material. Janko showed us videos and explained the perfect take-off: "The power at the take-off shall come from the legs only, but you should not just stand up. Your upper body must generate the speed. The girls have the power, no doubt. So now, we are working on the speed-generating and the angle they should slightly switch after take-off." Łukasz Kruzeck was more focusing on the ski position and the distance between body and ski, which means the whole system of the jump. He tried to give his jumpers instructions which they should adapt to their very own jump. Conclusion of both coaches: The afternoon session was the better one, despite the burning heat. After the last jump, Jan and I said goodbye to the coaches and went downhill and also took photos of the smaller hills here. "This was one of the situations where I really enjoy listening to somebody else more than when I am talking. That was really interesting", he said. "I like to ask questions about small aspects, but in general, I absolutely agree with you. And that is absolutely no problem during these kind of sessions, which is why enjoy these ones maybe even a bit more than the competitions", I concluded. 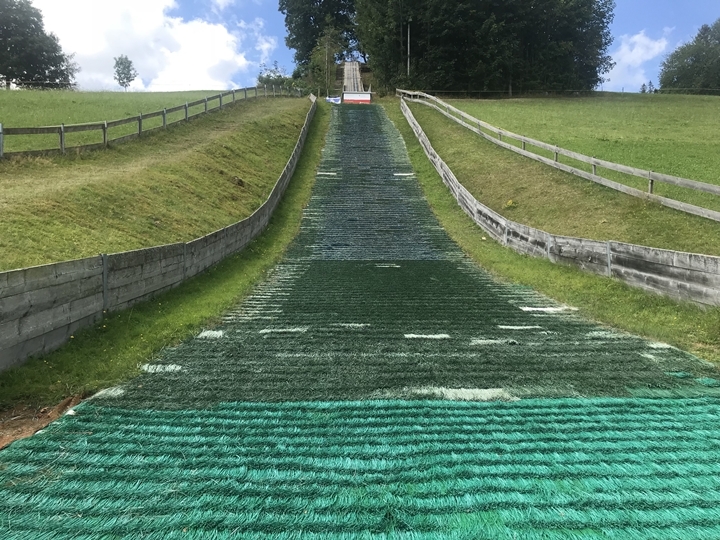 But, no matter if competition or training: Everything on this weekend in Hinterzarten was pure fun. I am already looking forward to the next one – hopefully soon!